Participants in the Executive MBA programme are mostly professionals active in industry and various enterprise sectors, generally in management and executive positions, as well as practitioners in specialist and technical roles. Final-year Executive MBA students taking the Entrepreneurship and Innovation elective with Nathaniel Massa at the University of Malta’s Faculty of Economics, Management and Accountancy recently completed feasibility analysis projects for start-up business ideas or intrapreneurial concepts. The concepts ranged from lifestyle, convenience-oriented and health related services, to tech-based sourcing and mobility solutions. 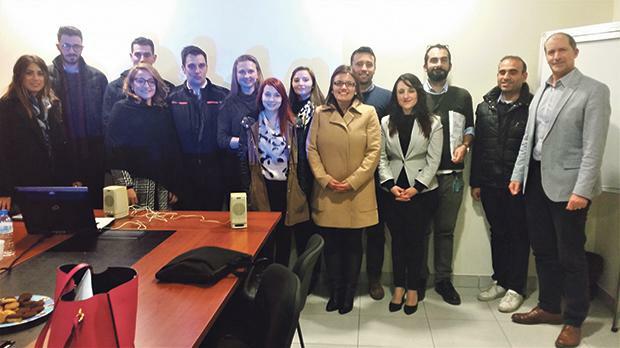 The students’ semester-long, team-based applied business start-up projects formed an integral part of the elective. It entailed identifying a novel business idea or concept targeting a market need or value generation potential. Following fine-tuning, the MBA participants worked in teams researching and undertaking a full feasibility analysis under the guidance of Dr Massa. The teams then submitted a comprehensive feasibility report and delivered a final presentation pitch, including working prototypes and live demos. Together with Maltese participants, the students in this year’s cohort included those of Indian, German, Italian and Russian nationalities. In order to assess their respective product’s technical, market, organisational and financial feasibility, as well as conduct a competitor analysis for their business start-up concepts, they engaged in extensive research, in various instances conducting surveys, focus groups and leveraged contacts and networks, including technical expertise. During the semester, the MBA start-up project teams also had the opportunity to stress-test and present their early-stage ideas to a panel of seasoned professionals at a Global Entrepreneurship Week event. The professionals hailed from areas associated with mentoring, foresight and creativity, knowledge management and IP, crowdfunding, and business consulting and are active in the entrepreneurship scene. The event was part of a broader international network spanning 170 countries powered by the Kauffman Foundation, hosted locally by the University of Malta’s Edward Debono Institute. The Executive MBA cohort was also hosted by Takeoff, the University’s incubator and start-up facilitator, and given an overview of the support and facilities on offer. Following the Executive MBA entrepreneurship project, various participants are now looking into the prospects of possibly taking their enterprise idea further. Participants in the Executive MBA programme are mostly professionals active in industry and various enterprise sectors, generally in management and executive positions, as well as practitioners in specialist and technical roles. Their exposure and diverse experiential knowledge contributes to the applied learning environment fostered by the Faculty and its multi-faceted team of expert and engaged practising academic staff on this part-time evening master’s programme. The programme is tailored for practicing professionals, managers, executives and others aspiring to stretch their competencies and extend their skill-sets, strategic foresight, execution and leadership capability. Beyond prospecting higher positions of responsibility within corporate environments, the Executive MBA offers participants an equally sound foundation and critical insight towards effectively growing and running one’s own business in increasingly competitive, globalised contexts. For further information on the Executive MBA programme call Sandra Said Zammit on 2340 2702 or e-mail sandra.said-zammit@um.edu.mt.